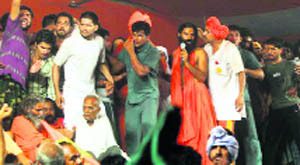 Slamming the government and the police for the midnight crackdown on Baba Ramdev and his followers at Ramlila Maidan in the Capital on June 4/5 last year, the Supreme Court today also blamed the yoga guru for resisting the police attempt to evict him and his followers. 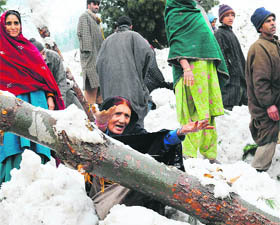 At least 14 soldiers (16 according to PTI) were killed and heavy damage was caused to infrastructure in two separate snow avalanches in the upper reaches of Bandipore and Ganderbal districts of Kashmir following snowfall and rains during the past couple of days. With the Farakka barrage issue threatening to become another flashpoint between West Bengal Chief Minister Mamata Banerjee and the Congress-led Centre, the government today decided to set up an inquiry committee to ascertain what went wrong and where to placate its temperamental ally. At one point, they were sportsmen, overeager to do ever better. They tasted drugs for sometime, only to realise that they were addicts. Money came and went as swiftly as the Fortuner vehicle that they first robbed, earning the "Fortuner gang" moniker. India is inching closer to the goal of polio eradication and hopes to be free of the deadly viral infection by 2014. In fact, transmission is at an all-time low, making a strong case for WHO to consider taking India off the list of polio-endemic countries, which also include Pakistan, Nigeria and Afghanistan. An 84-year-old Sikh man has sued his son, one of Britain�s wealthiest men, for 100 million pounds for trying to push him and his wife out on the streets and for keeping the hotel business to himself.